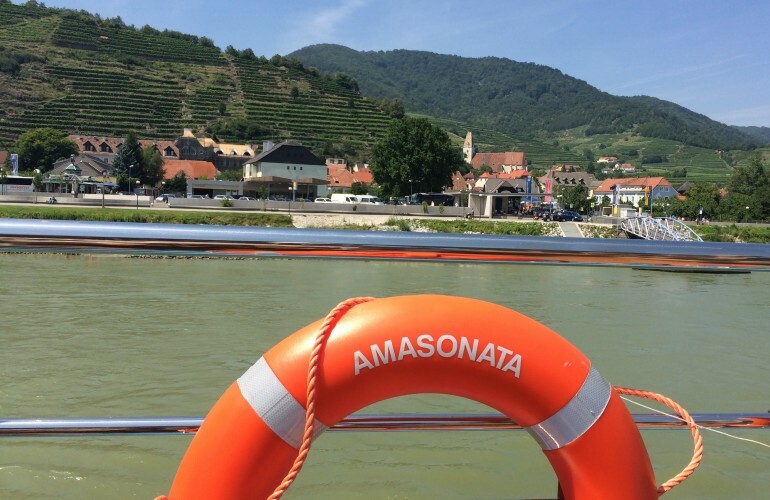 Funny, last month I sailed on AmaPrima’s identical sister ship, AmaSonata, on the same route but in the opposite direction—from Budapest to Vilshofen. And that was my sixth river cruise. So, Martha, I’ve got plenty of tips for you, as well as iPhone photos from last month’s trip to illustrate them. 1. Find out in advance which stretches of the river are most scenic. The biggest appeal of seeing Europe by river, in my opinion, is that you get to absorb the history and life of a region from a perspective that you miss if you’re traveling by train or car. The view out your window is always changing (except when the ship is docked or passing through a lock), and you don’t want to miss the must-see stretches. So ask the cruise director at what times you’ll be passing through the most picturesque or interesting parts, so you can position yourself on the open-air top deck or in the observation lounge. 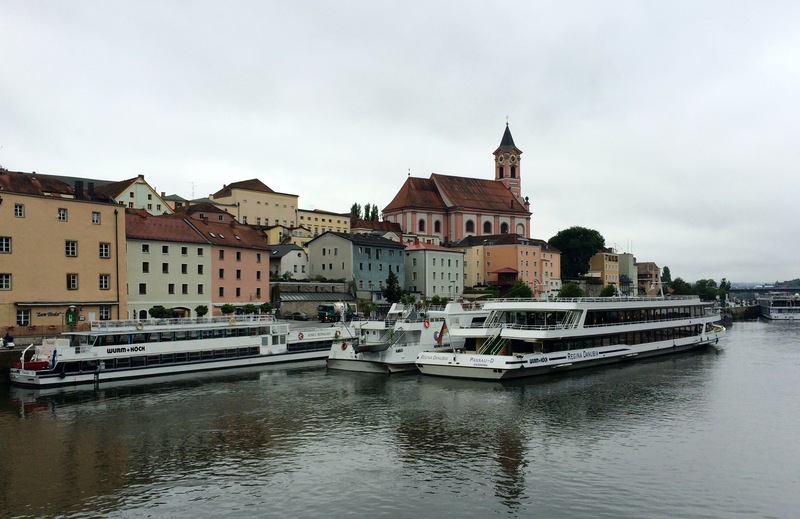 The entry into Passau, Germany, for instance, is a can’t-miss scene—it’s a charming town where three rivers converge, making for lively boat traffic—so you don’t want to choose that moment to, say, be taking a shower. 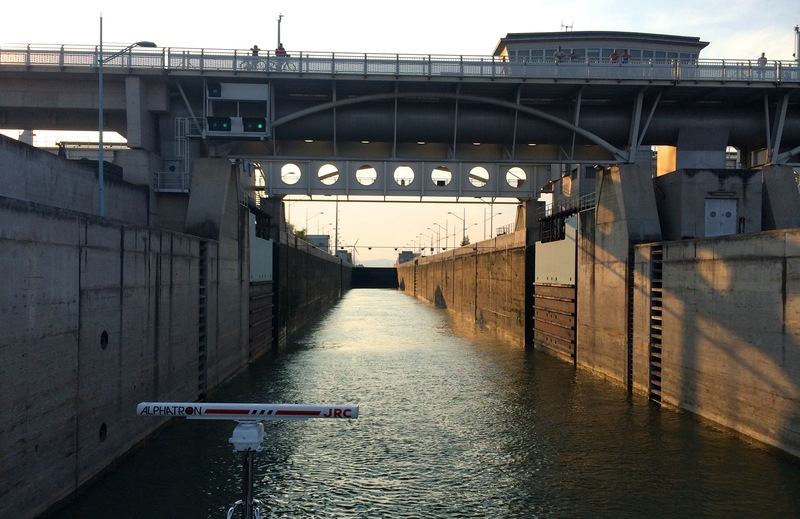 (A good time for a shower is when you’re passing through a lock. On an ocean cruise, you don’t need to worry so much about missing sights because most of the time when you’re moving through water, you’re staring at ocean. On a river cruise, by contrast, most of the time when you’re moving through water, you’re passing landscape.) Martha, I can tell you that two highlights of your Danube cruise will be the stretch through Austria’s Wachau Valley between Melk and Dürnstein (27 kilometers with no bridges or locks) and the nighttime sail in Budapest. 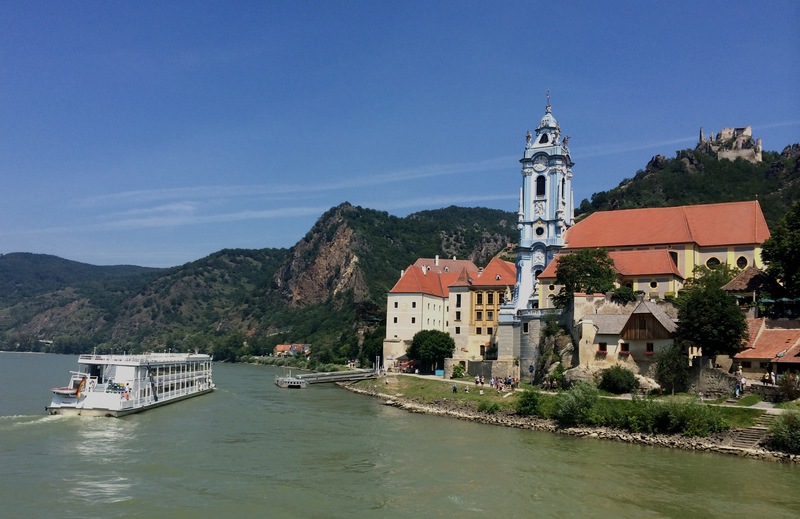 Dürnstein, in Austria’s Wachau Valley, is one of the prettiest towns on the Danube. Budapest lit up at night is also unmissable. That’s the Hungarian Parliament Building. 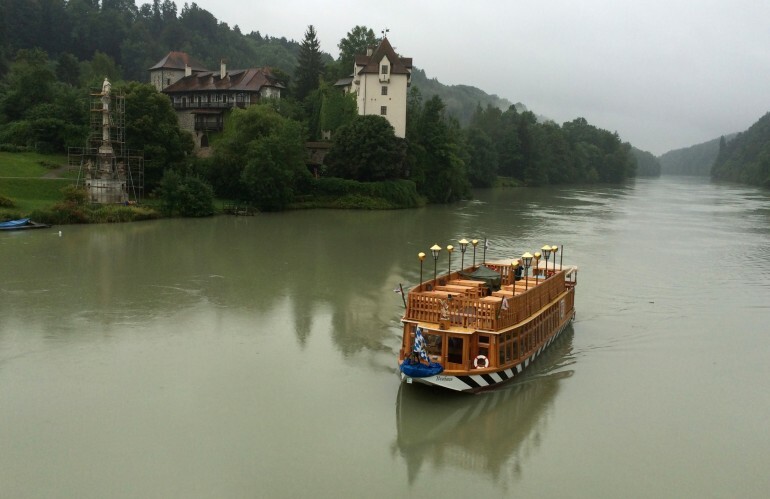 You don’t want to miss the entry into Passau, Germany—even if it’s raining. 2. Suss out what’s going on in each port on the date you’re there. When your ship docks, most of your fellow passengers will opt for one of the prefab group tours organized by the ship. I explore on my own instead—which is easy to do in European river towns—and it helps to know if any colorful local festivals or events are happening that day. At the time of my cruise, for instance, the annual Spitz apricot festival was happening (a must for apricot dumpling fans), as was an outdoor exhibition in Linz, constructed above the city’s rooftops, called Höhenrausch (“Thrill of the Heights”). To find out what’s on tap when you’re in port, check out the calendar of events on the websites of the country and city tourism boards (e.g., this one for Austria), or just walk into the tourist information office when you get to town. 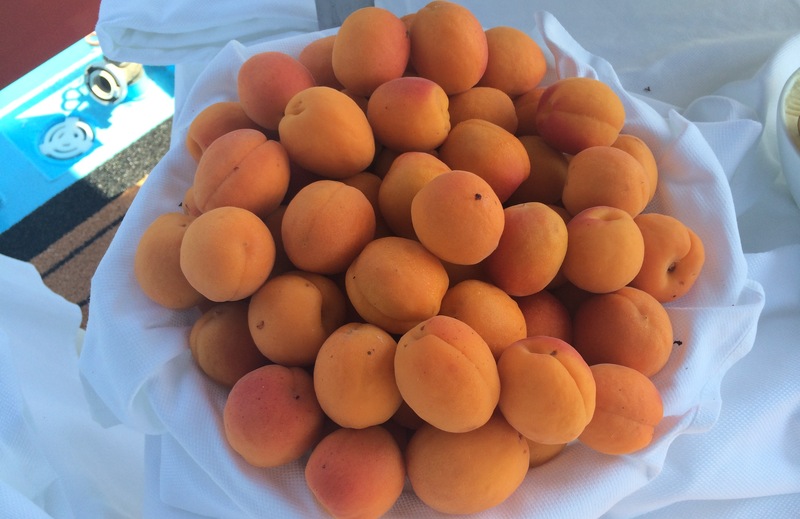 July/August is apricot harvesting season in Austria’s Wachau Valley. These were served on the ship. 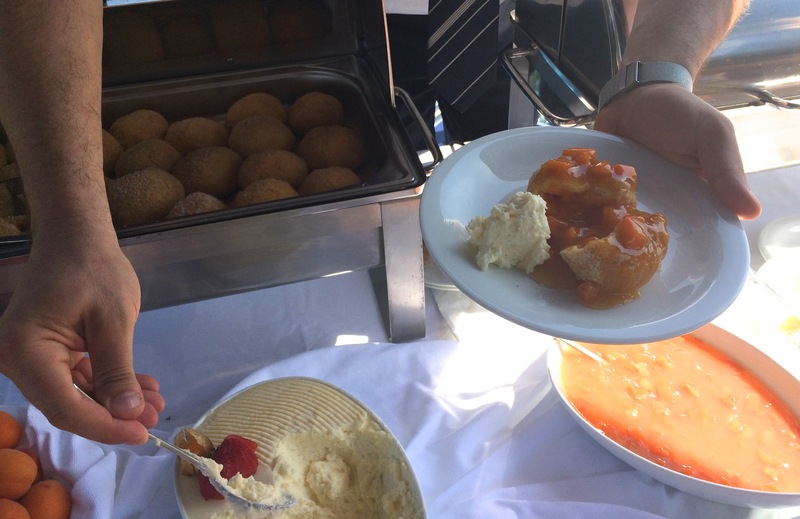 In case you can’t get to the Spitz apricot festival, at least you can try apricot dumplings on the ship. And in case you can’t get to Spitz at all, here it is. 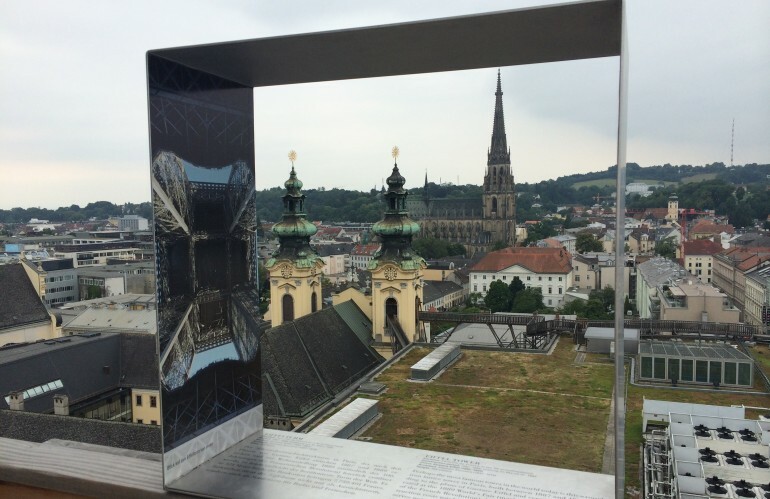 In Linz, Höhenrausch is an exhibition constructed above the city. Note the wooden walkways connecting the rooftops. 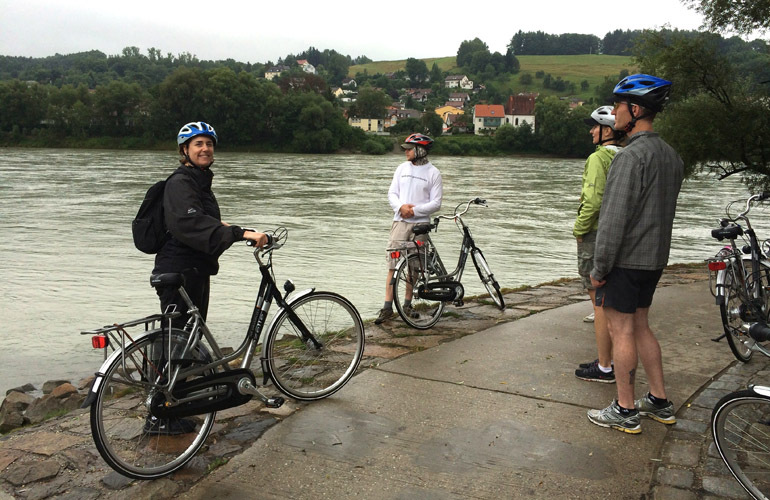 In Passau I joined the bike tour. Good thing I packed a rain parka. We biked along the Inn river to Wernstein am Inn. Good thing we didn’t let the rain stop us. 4. Pack shoes you can throw on fast and sprint to the observation deck in. 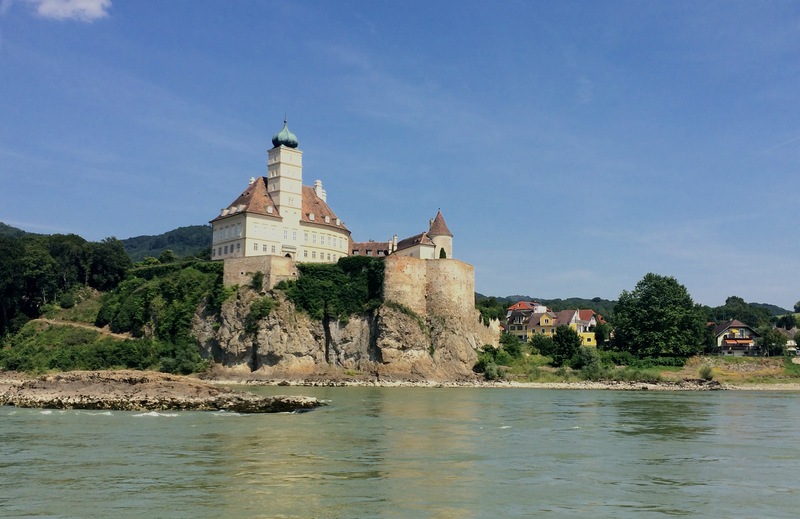 When you see a sight like this (Schönbühel Castle, in Austria), you want to see what’s on the other river bank too, right? Here’s what the top deck looks like. The top deck has drinks too. By the way, most cabins on AmaSonata have two balconies—one with chairs and one without. Here’s what the “French balcony” looks like, and here’s the “outside balcony” that you can sit on. 5. Find fellow passengers you like and suggest dining together. 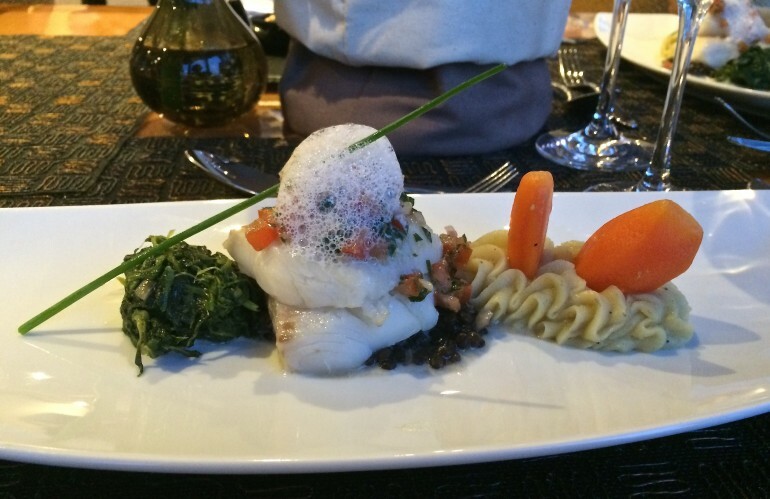 On river cruises you must dine at set times. On some ships it’s possible to grab a quick breakfast or lunch from the buffet, if you like, but dinner is a two-hour affair that cannot be rushed, since you’re dining at a table with other passengers. If you like those other passengers, dinner is fun; if you don’t, it’s dreary, and you’re stuck. So, if you meet people onboard whom you like, ask them to dinner. 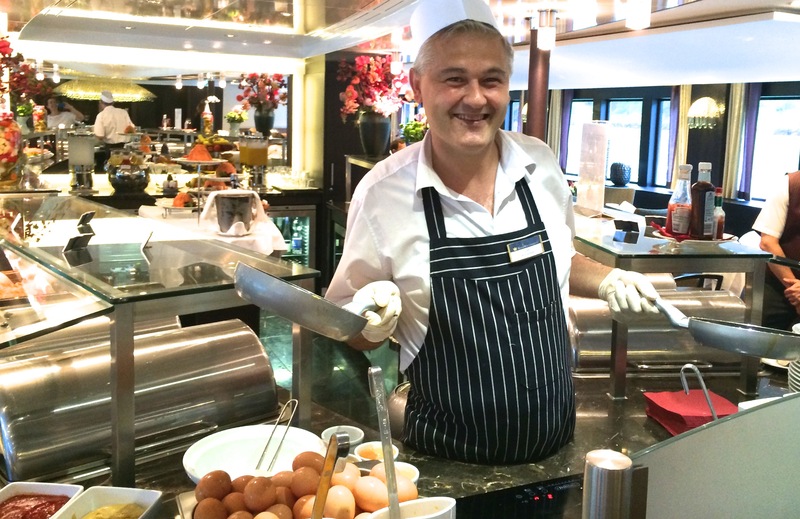 At the breakfast buffet, the chef can whip up an omelette pretty quickly—unless there’s a line. There’s never a line for the breads. 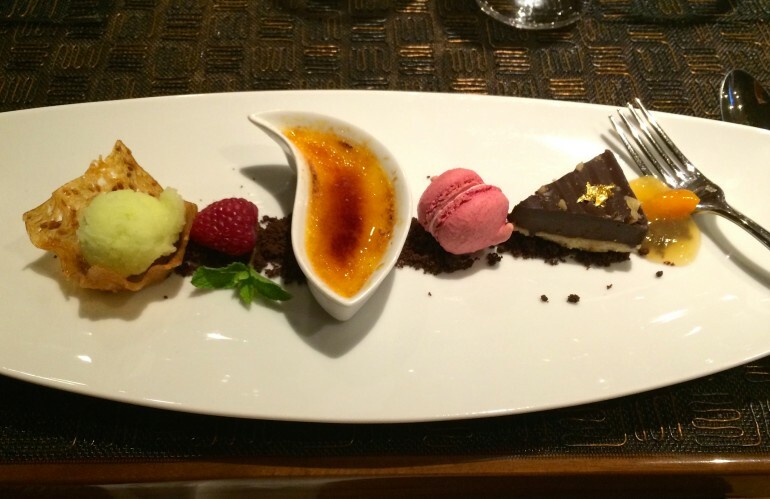 Dinner is a four-course affair. That creme brûlée in the center? Apricot-flavored, of course. 6. Don’t count on room service. 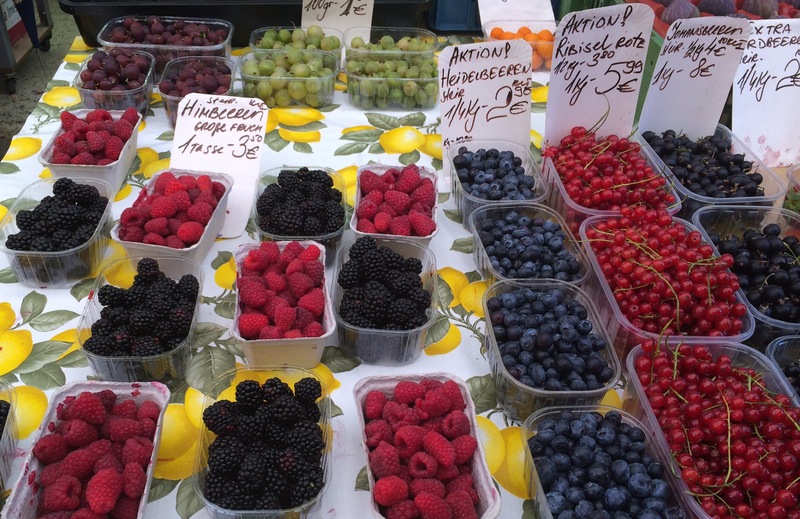 I found these berries at the Naschmarkt during our port stop in Vienna. Cheese and sausages from Käseland (Cheese Land) at the Naschmarkt in Vienna. Tomatoes at the Naschmarkt in Vienna. 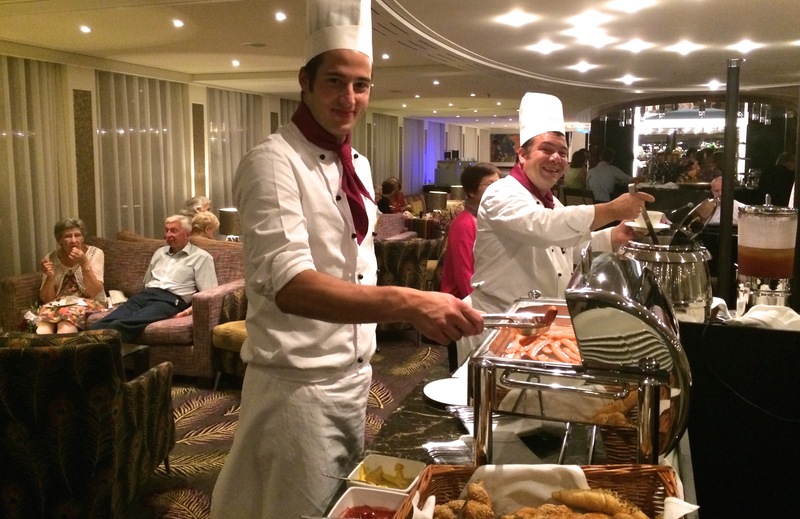 On one night a Bavarian buffet hit the ship’s lounge late in the evening. 7. Ask in advance about in-room computer access and entertainment. The “infotainment” you find in your cabin varies hugely from ship to ship. Onboard AmaSonata I had a large flat screen that was both television and computer. I could use it to search Google, find out anything about the ports we were headed to, create a spreadsheet, watch a first-run movie, or listen to music. And it’s all free, including the Internet access. Here’s my cabin’s Apple multimedia system, in front of the French balcony. 8. Prepare for spotty Wi-Fi. There are stretches of the river where you can’t get Internet access—especially when you’re going through locks—and times when your connection is slow because everyone else onboard is sucking up the bandwidth. At least the Wi-Fi is free (unlike on ocean cruise ships, where it’s even slower and excruciatingly expensive). There’s no Wi-Fi when you’re in a lock. I’m telling you, lock transits are a good time to take a shower: You don’t miss any of the river. 9. Plan on getting exercise off the ship rather than on it. 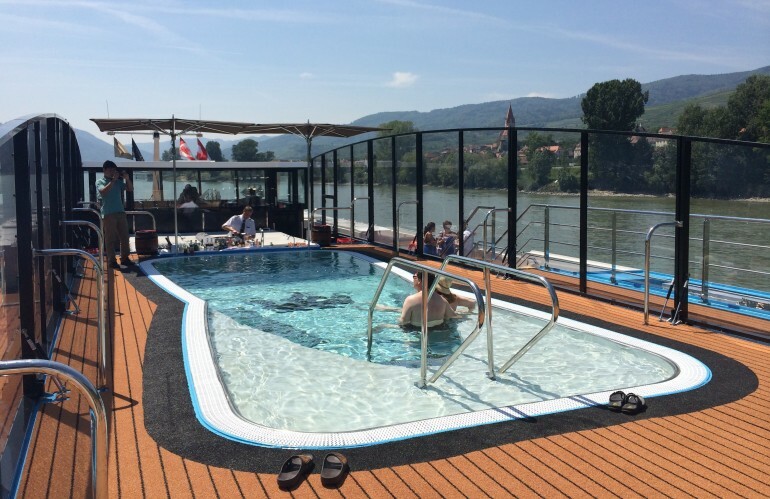 Most river ships of 160 passengers or more have a tiny pool on the top deck. AmaSonata’s is relatively large, is heated, and has a swim-up bar. My advice: Leave your deadlines at home so you actually have time to use your swimsuit. 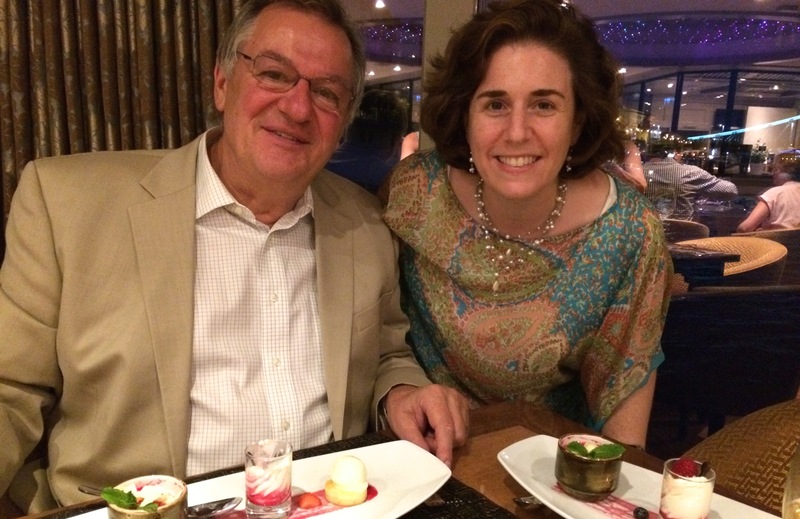 Here I am with AmaWaterways’ founder and president, Rudi Schreiner. Rudi Schreiner, the cruise line’s founder and chief architect, was onboard because it was AmaSonata‘s christening cruise, July 16-23, 2014, and he mingled with passengers throughout. Since it was a special cruise, many of the passengers had been invited as guests of the cruise line, including me, so this was a free trip. 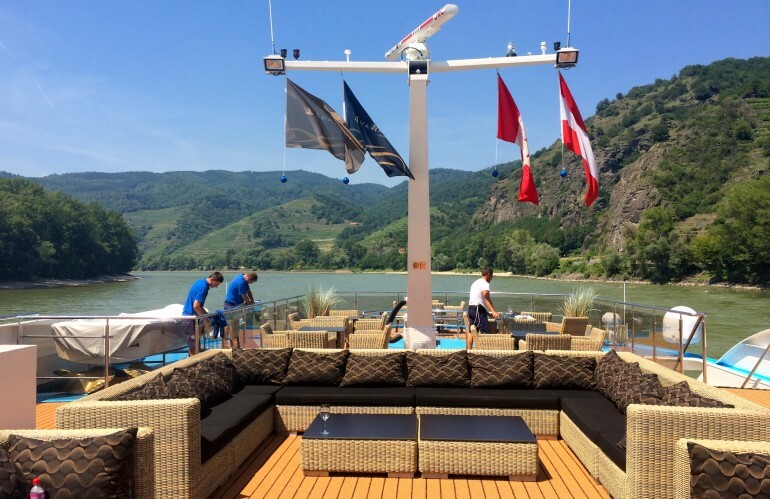 In keeping with my standard practice, there was no request for or expectation of coverage on AmaWaterways’ part, nor was anything promised on mine. 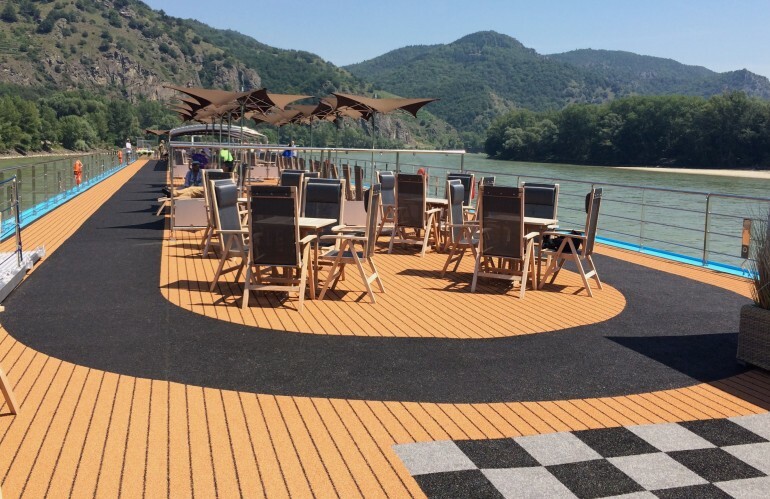 As I mentioned above, I’ve now taken six river cruises and am very familiar with the kind of services and treatment they offer; as a result, I feel confident that I can give my readers a fair evaluation of the experience. If there are any other river-cruise questions I can answer, post them below. Or, if you’ve taken a river cruise yourself and have advice to share, please do. 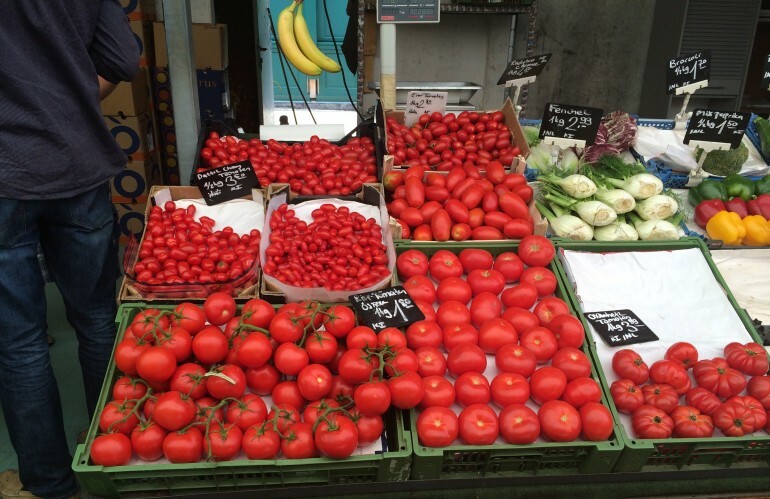 What do you wish you’d known beforehand that other travelers would benefit from knowing? I am planning a complicated trip. My husband wants to do the Romantic Road in Germany. I want to see Prague. We are considering a river cruise. We want to have scenery, castles and architecture. And we plan on meeting a friend and her 11 year old for a small group tour of Ireland and Scotland staying in castles. We anticipate the trip beinf 4-5 weeks and costing around $20,000 (our expenses). I am unsure, given the complexities, what TTE could handle this. Or should I contact multiple agents? Our 25th anniversary is coming up in June 2019. We are looking into a river cruise. It will be a one time trip for us. any and all suggestions are greatly appreciated. We have never been to Europe and are looking forward to going.I feel this is the best bang for the buck. Tho we don’t have a lot of money for extras I want my wife to have the trip of a lifetime. Our very first river cruise will be mid September on Avalon Waterways Creativity, Category A ( no idea what the latter means). Can you please enlighten us about this cruise ship and what to expect. The river cruise is Paris -Normandy. Rain gear and slip-on shoes noted in your post, anything else? Is there any riverboat cruise line in Europe that we can be assured of a table for 2 at dinner? Hello Christopher, My husband, sister-in-law and I are going on AmaWaterways Viola in June on the Melodies of the Danube. We started planning last year and decided on AmaWaterways because they did not charge my SIL the single supplement. That being said…since she got that discount she had to pay her own airfare where ours was included. Good Luck! Travelling the AmaWaterways river cruise Basel > Amsterdam in August and would like to consider the 4 day pre-sail extension in Zurich/Lucerne but there is not much info on the itinerary. Do you know anything about it? Thanks in advance. We took a Disney cruise last year and found the organizational tips very helpful: hanging a shoe bag in the room to hold hair products and small items, etc. We are taking a Mediterranean cruise soon on Viking – do you have similar tips for keeping things organized in the cabin for 12 days? Hello, We are a group of about 14 planning a river cruise in 2018. One thing we have been told is to book with Viking because they get better docking space. We were told that if you book with any other line you end up climbing over other boats to get off of yours. Is this true? Some of our group have more travel dollars than others, but don’t want to save money and compromise on convenience. What you are saying about Viking having better docking space is partly true, partly not. Its docking space will depend on the river and itinerary (since Viking has more favorable arrangements in some regions than in others). It also depends on the time of year you’re traveling (since there are more boats plying the rivers, and thus docking alongside one another, in peak season than in low season). 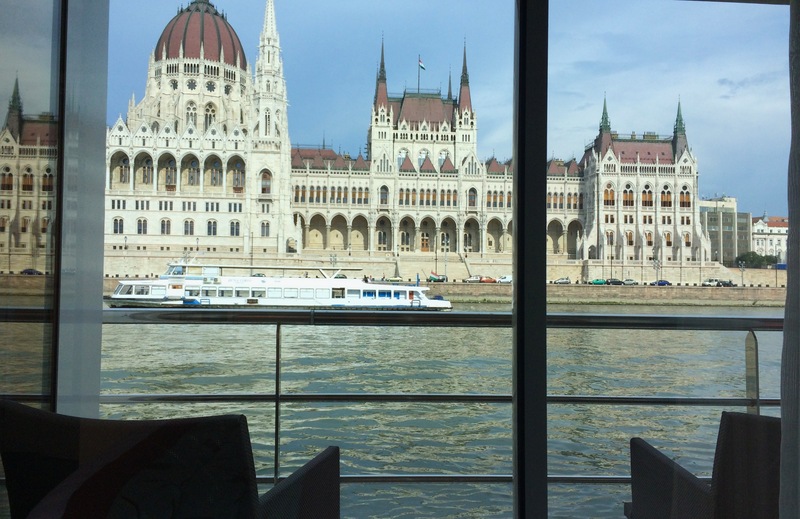 When I sailed the Danube on Viking, in some ports I had to walk over other boats to get to shore. 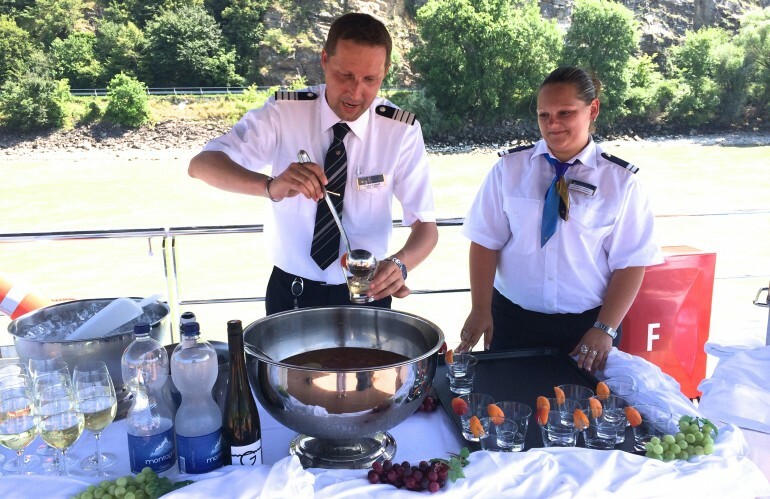 When choosing one river cruise line over another, however, there are much more important factors to consider than whether you will be passing through another boat between yours and the dock. (Passing through another boat usually requires only about a dozen steps; it’s hardly a big inconvenience.) Far more important factors include how far from the center of town you are docked, how many hours you spend in port, the quality of shore tours, what your rights are if the water level is so low that the cruise line has to bus you between ports, etc. 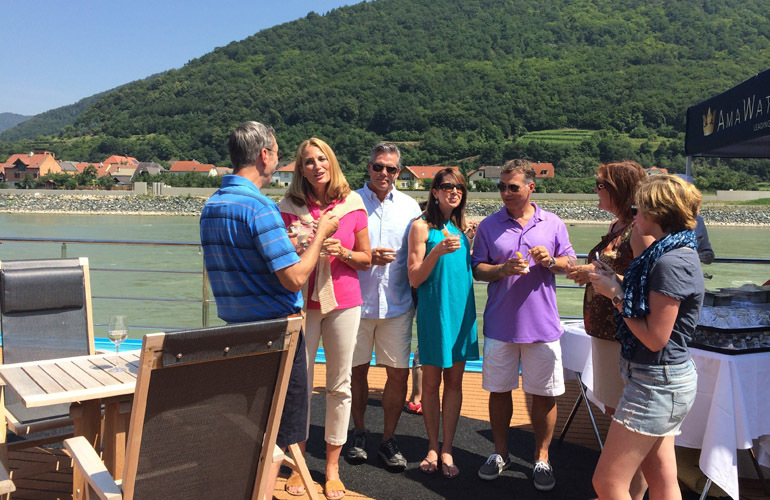 And I strongly recommend using the right travel agent who specializes in river cruises—one with the connections and clout to get you the best experience, and one who will be your advocate. If it were me, I’d reach out to Tom Baker via this trip request form. Also, in case it’s not clear, here’s what I’m doing on behalf of travelers and how you can get the most benefit from it: How to Get the Best Possible Trip: FAQs. We. are considering a river cruise from Amsterdam to Budapest. Do all cruise lines only offer a set formalized dinner seating? We are not into 2 hour meals. We are to travel on Amadeus Silver 2 in September Basel to Amsterdam. Haven’t seen much about this cruise line but are crossing our fingers that we will love it. Our first ever cruise as we usually travel independently. What can you suggest about choosing the day tours or exploring at stop overs on our own? Also we are not used to tipping; gratuities are not included in our price. How much should we tip? And who? Many thanks! Fabulous article and advice. We’re taking the AmaBella from Budapest to Vilshofen in a couple of weeks. It’s been years since I’ve been on a cruise. Could you give my husband and me some suggestions on dress code on board. Obviously we need to dress warmly for excursions but not sure what to wear on board. Thank you. I will be taking the Southern France trip on Saone and Rhone Rivers at the end of October, 2015. Should I bother packing a bathing suite? Thanks. I have taken 3 river cruises, 2 with Grand Circle and one with Gate 1 travel. I highly recommend Grand Circle.for 2 reasons: it’s travelers and tour guides. The travelers are well informed, well traveled people and the tour guides are tops in the regions they cover. 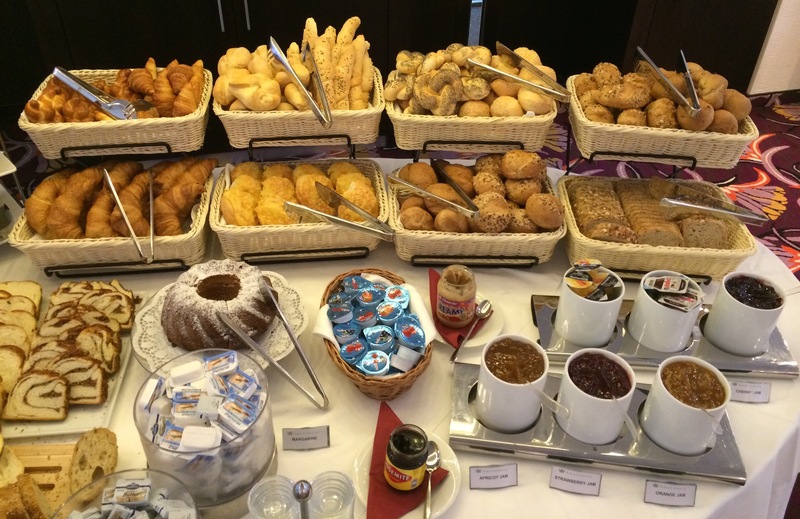 While not as high-end as AMA or Viking in their accomdations, food choices or amenities on the ships. I would not choose any other river cruise. We have taken 3 Viking cruises, have enjoyed each, and found some minor variations in service. We’ve traveled on 2 with different groups of friends, including one person with major food “challenges.” The chef met with her each day to go over the menu and plan alternatives for her. Advice on cabins: we prefer the veranda, but did have a “basement” level cabin on last cruise (major discounted fare). We were in the middle of the lowest deck and found it to be very noisy at night with sounds of engines, scraping sides of locks. 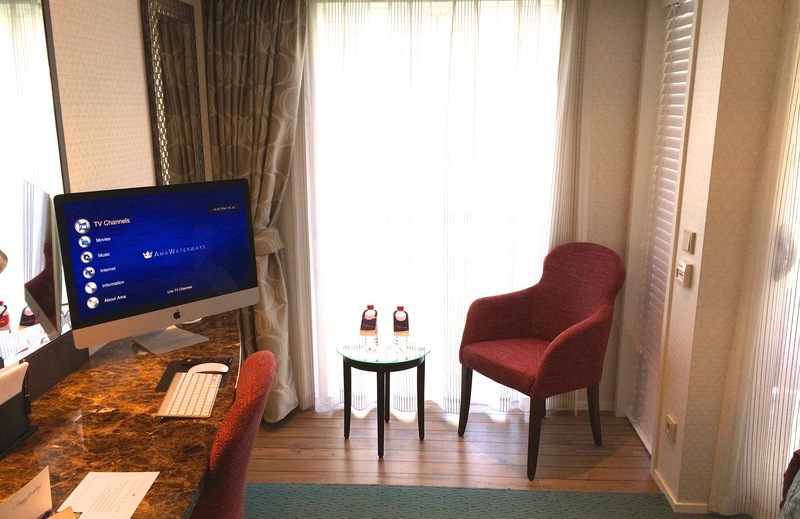 All rooms are quiet in terms of noise from surrounding cabins. We’ve liked the food, enjoy no assigned seating, and did like the beverage package in China and Paris to Prague trip. Do not do beverage packag in Portugal- very restricted offerings due to government controls. Staff fluent in English, especially in China. Supplemented tours with pre-arranged tours. Go and enjoy! We used laundry service each cruise- reduces amount to pack and excellent service. 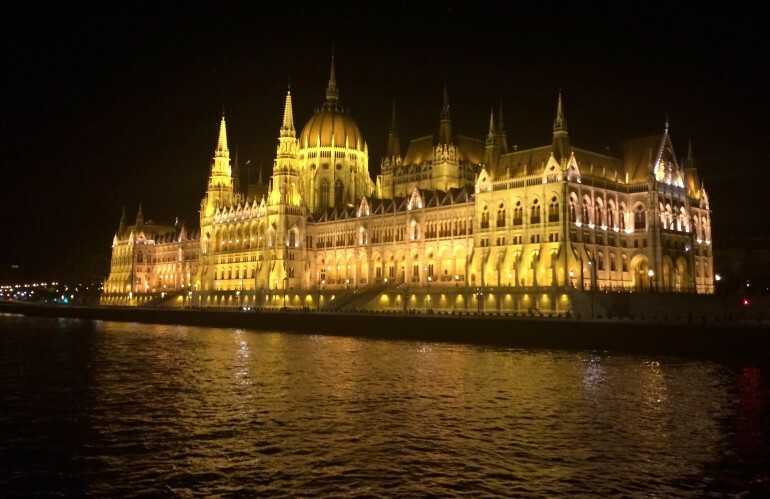 We will be taking the July 11-24, 2015 Danube River Cruise. Is there a night that we will be expected to dress up? Your answer will help us decide whether my husband should pack a suit and I, a dressy dress and shoes. Thank you! Generally speaking, guests on river cruise ships dress casually, though respectably. There are no “formal nights” or “semi-formal nights” the way there are on some ocean cruise ships, so there’s no need to bring a suit or dressy dress. You’ll want to look pulled together, but you can look pulled together just wearing black pants, flats, a nice top, and jewelry. Your husband should probably bring one or two nice collared shirts and a blazer. He won’t need a tie, though ties take up so little space that my husband always packs one, just in case. He might want to wear it if you go to the opera in Vienna or something. Nice tip! I’ll be a first cruise traveler sailing next month and this gives me idea what to do there. I didn’t know you can do cycling during stop overs, but if course that will depend on the place you will be going. Thanks for sharing your thoughts! Which river cruise line has the best mattresses? Like pillowtop? And which ones have the quietest rooms? Or what area of the ship should we ask for? I just returned from the Ama “Christmas on the Rhine” going from Amsterdam to Basel with the Lucerne-Zurich extension. If you are thinking of doing this trip remember that in Europe everything is closed on Sunday and the Christmas – New Years Days, even restaurants. The ship Ama Reina was comfortable and the cruise director was excellent!! This was my second Ama Christmas trip and I found that the food was boring and cold. Trying to have my salmon be medium rare as well as my beef was next to impossible. There was little, if any, changes in the choices at breakfast and lunch. The main dessert was excellent home made ice cream. I don’t understand why they bused us from Lucerne to Zurich when a train would have been much faster. The hotels in both cities were a good long walk to the center of the town and the hotel in Zurich initially gave me as a single a room so small I could not put my suitcase anywhere that it could be opened fully. Other than the food on board the ship everything else was excellent. 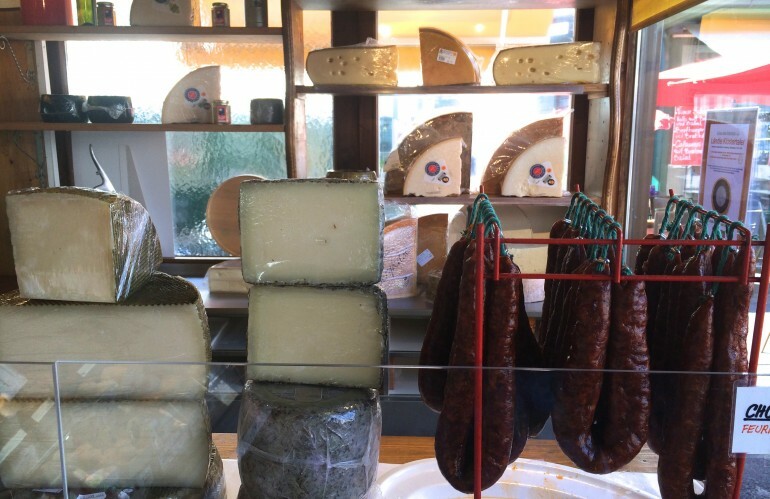 We traveled with Viking Cruises on their Southern France tour (18 months ago). While we would travel with them again, there were some key disappointments. While I cannot eat “anything that goes moo” (beef or dairy) I can eat goat and sheep dairy and any other meats. Knowing France extremely well, I knew that this is (generally) no problem whatsoever. I was disappointed to find that, one, in spite of conversations assuring me this would not be a problem…..it was, and two, of the extensive kitchen staff, not one was of French origin, with the head chef being German. I expected to eat predominately French inspired food. I believe it did not happen. I also found that the “treats” of chocolate chip cookies and muffins, to play to naive American tourists. Add all this to the fact that there were never any “treats” that I could eat, I found being offered “Salmon without the sauce” unacceptable for $1000/day. Believe me, we will be making these guys commit next time. Thanks, Wendy for excellent suggestions! 1)	Cruising up river is normally windier and colder than cruising down river, when the wind is typically behind you. So if you plan to spend time on the top deck, you’ll be more comfortable cruising downriver. 2)	A balcony of any sort isn’t necessary if you’re traveling in the colder, and less expensive off-season months. 3)	But the offseason months have far less tourists, which means you won’t find hordes of passengers from multiple river cruise ships crowding some of the smaller (and lovelier) river ports. 4)	Determine in advance the best places to bike and reserve your bike for that day as soon as you can. Biking isn’t good at every cruise port, so planning is necessary. 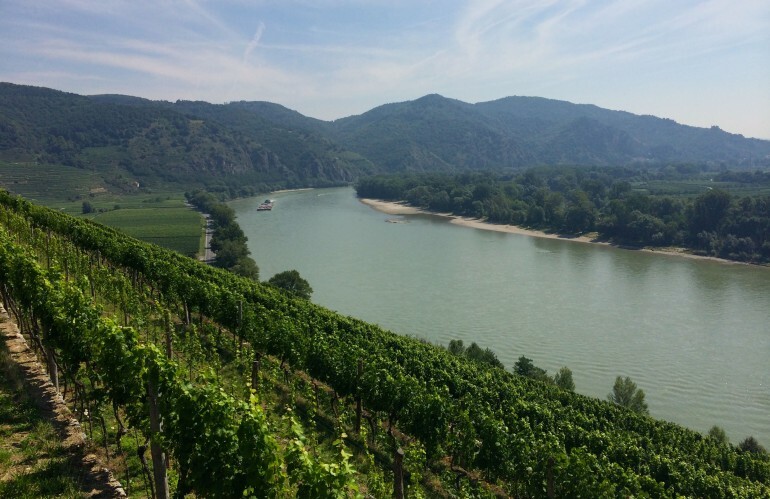 As an example, the ride along the Danube through Austria’s Wachau Valley is one of the most beautiful, but also the most in demand. I also love to ride along the wide quay of the Rhone River in Lyon, as there’s a wonderful art museum along the way, as well as Les Halles de Lyon, the market of famed chef, Paul Bocuse where one can buy every food and wine item imaginable and stock up for a picnic. 5)	Each of the four major river cruise lines has an element that’s better than the others. And everyone has different needs, so find an experienced travel councilor that’s cruised on all, and they can help you define your needs and recommend the best river cruise line. 6)	Always fly in at least one day early – so you won’t hear the old saying ”You just missed the boat”. What are your four major river cruise lines? And the three you have experienced? I like your suggestions of making a choice based on what’s important to you, rather than other ratings, but have read criticisms of poor alternate travel arrangements by the cruise company when rivers are inaccessible for a variety of reasons and busing from point to point to resume the river cruise is necessary. Do have any suggestions or recommendations to prepare or avoid such problems? Thanks! This is wonderful advice…we are headed on AMAPrima in the opposite direction in a month! There are several tips here that I hadn’t seen anywhere else yet, and believe me, I’ve read EVERYTHING to prepare for this trip. Yours are some of the best “detailed” pictures I’ve seen of these sister ships, we can hardly wait to be on board! Thank you for disclosing you financial relationship with AMA on this trip, it’s an important thing to know, and not all bloggers share it honestly.